Let’s just say director Gary Winick’s track record is nothing to be inspired by—13 Going on 30 and Bride Wars amongst those he helmed. But, while he brings tripe like that to fruition, his producing credits include a few gems like Starting Out in the Evening and, a personal favorite, Pieces of April. 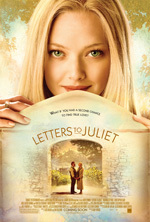 Watching the trailer for his latest, Letters to Juliet, one can almost see what is a hybrid of the two types. Don’t get me wrong, there is a ton of romantic, true love, heavy-handedness, yet beneath that surface layer is a story unafraid to touch upon more complex relationship traits. Amanda Seyfried’s Sophie is engaged, in love, and on the cusp of finding her voice to pursue the dream job she’s always wanted. So, the film’s travels with her and the woman hoping to find a love she let go fifty years prior becomes more than just a rekindling of long lost feelings, or Sophie’s own weakness in falling for Claire Smith-Wyman’s grandson Charlie during the journey. It is also about this young woman letting go and seizing the day; discovering that the safe path before her may look wonderful on paper, but is still missing that final ingredient. It is about the courage to fight for one’s own life, without compromise. Sophie writes back to Claire (Vanessa Redgrave) under the penname of Juliet’s Secretary. The literary figure’s ‘house’ in Verona, Italy is a place for romantics to go and seek solace, writing to Shakespeare’s heroine, asking for answers to their troubles. A quartet of women—three older and accustomed to questions about marriage and loss with a fourth young and capable for those lost in love—have taken the job of writing back, giving the tourists a taste of romanticism and the true believers something to hold onto. Sophie, however, when helping to remove letters left, finds one half a century old behind some loose rock. It is from a Brit over in Italy at sixteen, readying to return home and afraid to stay with the man she had fallen for at first sight. With so many years in between and most likely two long and fruitful lives later, she decides to write back, saying that if Claire’s feelings remained the same, she should look for him one last time to prove her love has no bounds. One could say writing such things could only end in tragedy—both parties could be happily married, both could be dead—and Claire’s grandson Charlie (Christopher Egan) believes just that. Others, however, might think you can’t live passionately without finding if he is still there waiting. What Letters to Juliet has going for it is that the trailer gives everything away. It shows us the dashingly weathered Dos Equis-looking (as my father blurted out ‘Stay thirsty my friends’ at the perfect moment in the theatre) Lorenzo riding his horse towards his love as well as Sophie’s own smitten visage when looking upon Charlie, the boy who is such a handful and so unlikable that you know a connection will be made. It is all right there, so if you have any reservations on whether either pair of star-crossed lovers will end up in each other’s arms, you are seriously the most naïve person on earth. Like so many romance-infused dramas then, the success of the movie lies with the journey taken and whether it can entertain enough to get past the inevitability of it all. This one does its best to accomplish just that, having a fair share of good laughs as well as some conflict to at least keep the audience on its toes—I’ll admit to almost believing the ending might not be so happily ever after before I remembered it was Hollywood. You can’t deny the beauty of Verona and Tuscany on display, nor the very light-hearted atmosphere used. Some plot points are flimsy, like Sophie’s own fact-checking job at The New Yorker while she toils away to be noticed by her publisher (an uncredited Oliver Platt) as a writer. I guess her timidity and lack of confidence to show this man anything more than how good she is at finding the truth for ‘real’ writers does play into her relationship trajectory, though. Something about the NYC bookmarks just rung hollow for me, almost tacked on solely to give her an excuse to tag along with the Wymans as Claire went searching for Lorenzo. That rejection and desire to prove she has it in her to become published does drive her tenacity, but without the absolute ambivalence of fiancé Gael García Bernal’s Victor, she would have simply peered upon the sights before going back to utter obscurity at home. His character is the epitome of career-driven and selfish, turning his abandoning of her into ‘win-win’ situations since she’d be bored going with him anyway. It is a pre-honeymoon of complete separation; one that would only show how stupid Sophie was if she stayed with him. I did like Seyfried in the lead role, combining a good mix of headstrong feminism with that desire to be loved and taken care of by the only man she’ll ever need. Whether the actress can ever break the mold of genre fare such as this—it is weird to remember how ditzy and vapid her role in Mean Girls was considering everything now shows her as an intelligent, contemplative girl next-door—remains to be seen, but for now she appears to have found her niche. Bernal does his best to be the clown, something this leading man has too much charisma and talent to pull off. I would have been utterly dismayed if he in fact was playing an Italian, but thankfully they do throw in a couple moments to prove he’s a Spaniard pretending to be of the heritage he cooks with his restaurant. The real successes are the Wymans. Redgrave is fantastic as Claire, serving as the motherly figure Sophie never had; the tough but caring guardian of her grandson; and the woman looking for a love never forgotten. Her interactions with the failed Lorenzos are always on the nose. As for Charlie, Egan is the best part of the entire film. His sarcastic wit and pitch-perfect delivery of barbed dialogue never misses a beat. He brings the entertainment that kept me interested through all the obvious moments, making his character three-dimensional and realistic once the passion hidden inside finally breaks through. CHRISTOPHER EGAN and AMANDA SEYFRIED star in LETTERS TO JULIET. Photo: John Johnson © 2010 Summit Entertainment, LLC. All rights reserved. (Left to right) VANESSA REDGRAVE and AMANDA SEYFRIED star in LETTERS TO JULIET. Photo: John Johnson All photos: © 2009 Summit Entertainment, LLC. All rights reserved.